Wednesdays can be busy, with two drop-in clinics to attend, and not much time in between them to clear up, drive to the hospital, park and then help set up for the afternoon. 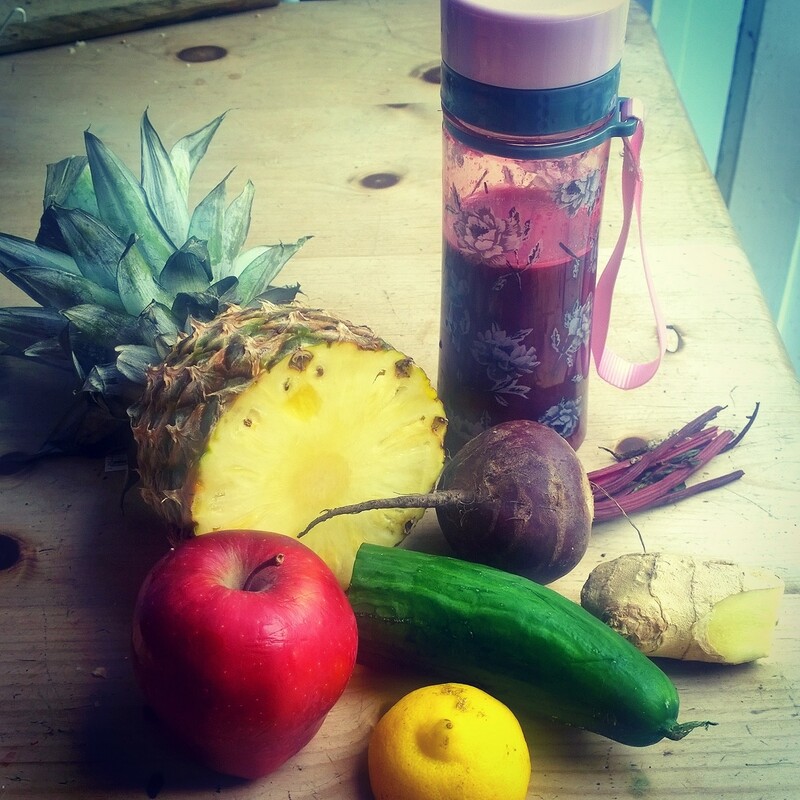 I need a lunchtime boost which preferably doesn't involve queuing for ages for canteen food or crunching my way through a home-made lunch box, which is why I like to pick up a juice I made in the morning, from my fridge en route. I juice my pineapples with the skin still on, as this is where the bromelain is found. This is an enzyme which aides digestion and helps dissolve excess mucus, as well as being a great anti-inflammatory. Cucumber is an excellent diuretic, and ginger is a natural antibiotic and decongestant. Lemon is cleansing and helps to eliminate toxin. I love the beetroot juice the best, it is as thick as blood and looks just as potent. It cleanses the liver, and helps to reduce hardening of the arteries. All together this juice gives a hit of potassium, calcium, sodium, iron, phosophorus, chromium, magnesium, sulphur, chlorine and bromelain. It's easy and refreshing to drink if you're lunching in a hurry, and doesn't tire you out as it's so easy to digest. You might want to wipe your mouth afterwards though, and be careful of fluorescent pink spillages from the beet!